Yesterday (Monday) we got the vast majority of the drip lines installed in the garden. Our supplier was out of one of the adapter pieces we needed to connect the timers in all the beds, so only the 4 largest raised beds are completely hooked up right now. The others have drip lines in place while we wait for the remaining connectors to come in. We are using Netafim tubing with in-line emitters every 12 inches. The flow rate is 0.6 gallons per hour. The first thing we hooked up was this gadget. On the right side you can just see part of the red handle that turns the water on to each bed. To that we connected one of these Nelson irrigation timers. It is a very cheap timer (about $10.50 each) that just mechanically clicks down the minutes. It can be set to run up to 2 hours or set to be “ON” manually. 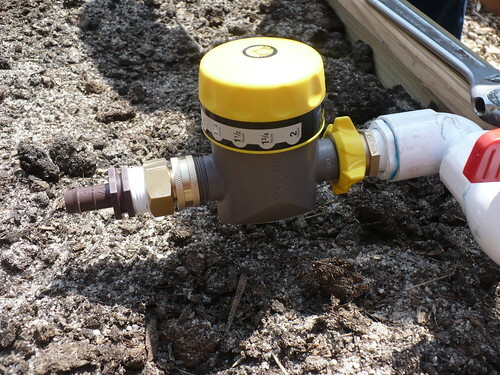 The timer was then connected to the brown connector for the drip line. Don’t forget your teflon tape to keep them from leaking! The next step was to stretch the drip tubing the length of the bed. We decided to put 3 lines in each bed. We have always had 2 in each bed, but we had trouble keeping them evenly watered. We’re hoping that 3 lines will be better at even watering. We connected all three lines on each end use “L” and “T” connectors. Here you can see one of the “T” connectors that we were putting in. 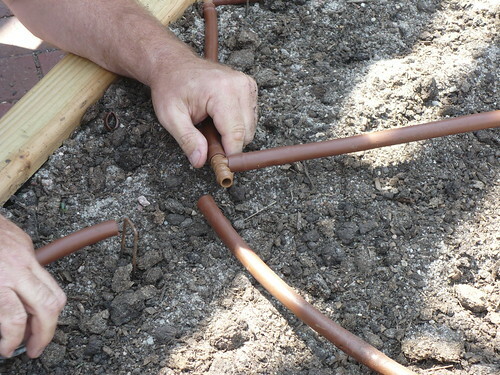 I should note – it is much easier to put these drip lines together on a warm day than on a cold day. The last time we replaced some lines in was on a cool March morning, and they didn’t want to go together for anything! The upper 70s of yesterday afternoon were perfect. Here you can see the finished drip line in the treated lumber bed. 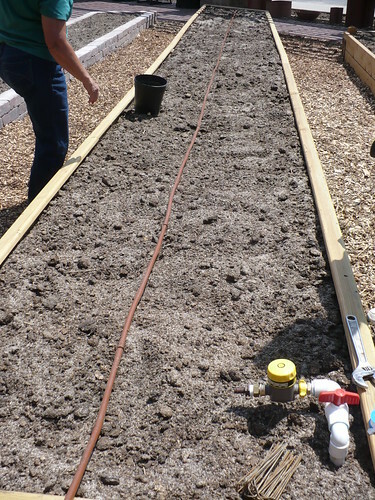 We secured the lines with the metal “staples.” Because of the way the irrigation spigots are in place, how we connected the drip lines was a little different in each bed. When we got to the plastic lumber bed that has the second tier on it, we got to try something new! I think that ordinarily it wouldn’t be ideal for the lines to go up and down, but it was only about a 6 inch rise and we have plenty of water pressure! 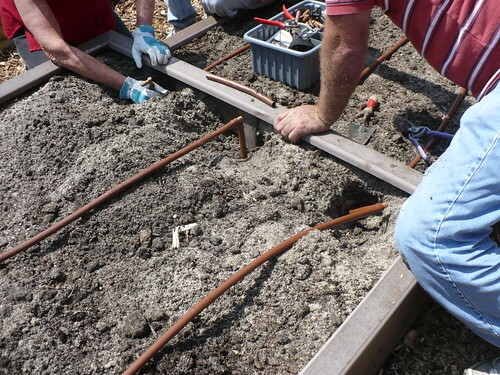 We brought the lines up inside the second level beds, using the “L” connectors to keep the lines straight. 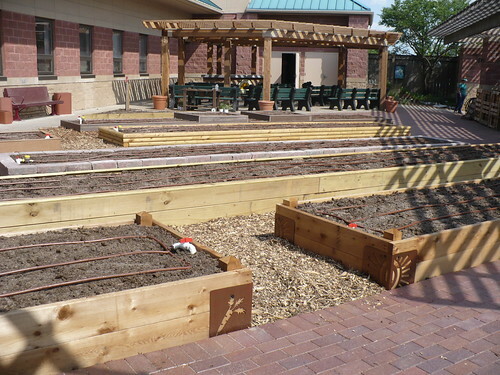 Here you can see all the beds with the drip lines in them. We had all the connectors for the 4 largest beds, and we will hand water the rest until the final pieces come in. 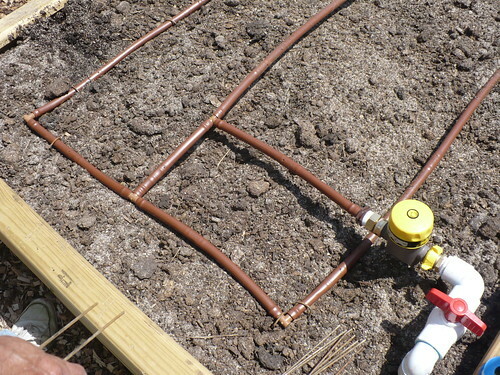 Posted on May 15, 2012, in Working in the Garden and tagged drip irrigation, garden renovation, irrigation, watering. Bookmark the permalink. 3 Comments. Wow! very good and illustrated use of drip irrigation plants and placement method. But there are many other useful methods and manners of installing drip irrigation plant and methodology.